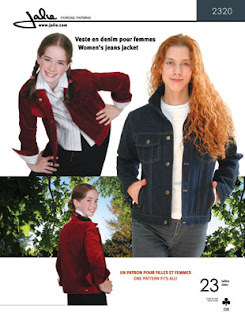 I recently received many emails from people looking for our Women's Shirt (2322) and Jean Jacket (2320) patterns. Both were discontinued a while ago and since we will not reprint them, we decided to add them to our e-pattern line, along with the 2443 gymnastics leotard pattern. You can now purchase them at www.jaliesewingpatterns.com. Once you save a pattern to your computer, you can print/cut it as often as you need. Taping the pages is time consuming, but you don't need to trace it afterwards... Simply cut the pattern and print it again in the future if you need it in another size.